This could be the next best thing to a Alfa Romeo 4C Quadrifoglio. We were relieved when the 2019 Alfa Romeo 4C Spider was given a new lease of life for the 2020 model year. Its Coupe sibling, on the other hand, has been scrapped in North America, despite still being sold in Europe. That hasn’t stopped German tuner Pogea Racing from giving the 4C Coupe the power it deserves. Their latest tuning kit, dubbed Zeus, essentially transforms the mid-engined sports car into the high-performance 4C Quadrifoglio that Alfa refuses to build. Whereas the standard 4C develops 237 hp and 258 lb-ft of torque from its four-cylinder 1.75-liter engine, Pogea Racing has increased the output to a more respectable 346 hp at 6,100 rpm and 338 lb-ft from 2,800 rpm. This power boost was achieved by installing a modified turbocharger, upgraded high-pressure pump and injectors, and a stainless steel exhaust with carbon tips. With over 100 extra horses and 80 more lb-ft of torque, performance has been significantly improved. 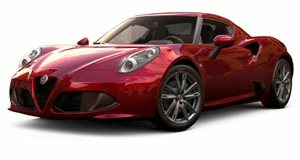 The heavily modified Alfa Romeo 4C will sprint from 0-62 mph in 3.4 seconds, which is 1.1 seconds faster than the standard model. Top speed has also increased from 160 mph to an impressive 189 mph after getting from 62 mph to 124 mph in 8.1 seconds. Thanks to extensive use of carbon fiber, the Zeus is also considerably lighter compared to the standard model, tipping the scales at just 1,993 pounds with a full tank of gas. To complement its performance boost, the modified 4C looks more aggressive thanks to a prominent rear wing and 18-inch front and 19-inch rear wheels, as well as Pogea’s coilover suspension that reduces the center of gravity by nearly two inches. A hydraulic lift system will also lift the front axle to protect the car’s nose. Inside, the 4C Zeus gets Bentley-style black Nappa leather with orange accents inspired by Lamborghini and perforated leather surfaces sourced from Porsches, along with velour floor mats featuring light blue stitching, nubuck edging, and a stitched logo. Pogea Racing is only making ten examples of the Alfa Romeo 4C Zeus. Three of them have already been built and delivered to their new owners. Pricing for the remaining examples starts at €50,100 (around $56,850) excluding the cost of the donor car, but they probably won't be available for much longer if current demand is any indication.